Custom Build Your Own Intimidator! | Intimidator Inc.
Summer's here. The trails are calling. All that's missing is your very own UTV. 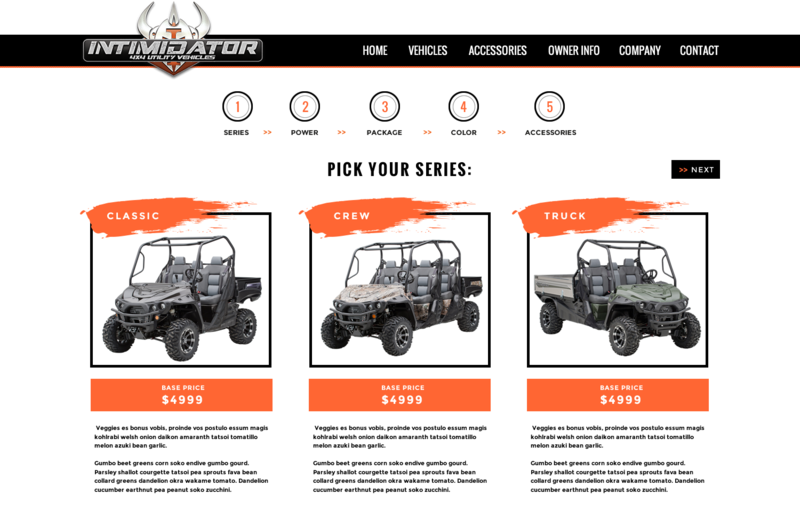 Intimidator is constantly trying to make our customer experience better for YOU, and we are now excited to offer a Build Your Own Intimidator feature on our website so you can custom build the Intimidator UTV you've been dreaming about. We've made it easy too. Step by step instructions guide you through the Build Your Own Intimidator process. Go to IntimidatorUTV.com and click on the button 'Build Your Own Intimidator UTV'. Begin building your custom machine by choosing which series you'd like - Classic, Crew, or Truck. Base prices range from $10,999 to $13,999, depending on which series you choose. Pick your power - 1000cc Kohler Diesel, 800cc Intimidator Gas, 750cc Kohler Gas, or 48-volt Brushless Electric. These choice options will vary depending on the series you choose. Pick your package - XD4 or the Base Package. Select the color you would like - Orange, OD Green, Metallic Black, or Camo Upgrade. These may also vary depending on prior choices. Depending on your choices there may be additional options available. Time to accessorize! We've added just a few of our awesome Intimidator accessories to get you started, but you can visit Bad Dawg Accessories for every UTV accessory under the sun to deck out your new Intimidator machine. You can now PRINT the overview of your customized machine and send it on to the dealer nearest you. Once you submit the form, a local dealer will contact you with details on how to get your completely customized Intimidator UTV! Prices may vary as dealers often have promotions and deals they can offer. That was easy. So is purchasing an Intimidator. Check out our Build Your Own feature today, and the rest of the Intimidator products and information at IntimidatorUTV.com!